Patricia Jaimes has received the MSU Department of Geological Sciences Neil Research Award. Paty will use this award to fund data collection and presentation of research findings for her project, Within and Beyond the Leaky Pipeline:Understanding Minority Student Transitions in Earth System Science. The Geocognition Research Lab is proud to announce that first-year graduate student Patricia (Paty) Jaimes is the proud recipient of a National Science Foundation Graduate Research Fellowship! Paty’s research project, Within and Beyond the Leaky Pipeline: Understanding Minority Student Transitions in Earth System Science, will allow her to explore the underlying causes of the lack of diversity among Earth System scientists. Paty’s work has the potential to dramatically influence what it means to be a scientist studying the planet and we are all looking forward to both her research and her recommendations for diversifying the field! GRL student Patricia Jaimes receives award! Patricia Jaimes, a first-year student in the Geocognition Research Lab, has received the 2016 Tracy A. Hammer Award for Professional Development from the Michigan State University College of Natural Sciences. This award is made even more special because Fellow first-year graduate student Caitlin Kirby made the nomination. Congratulations to both students! I’m looking forward to future surprises from my amazing cohort of current students (Caitlin Kirby, Patricia Jaimes, and Amanda Lorenz) and am so thankful that they support each other! Paty Jaimes Receives On To the Future Award from the Geological Society of America! New graduate student Paty Jaimes has received an On To the Future award to travel to the 2015 Geological Society of America annual meeting. Congratulations, Paty, and well done! I hope other students consider applying to help diversify the geosciences! Welcome Paty Jaimes to the GRL! The GRL is pleased to announce that Paty Jaimes has officially joined the lab, and is already hard at work helping to reorganize space and enter data. Welcome, Paty, and good luck over the next few years as you become a geocognitist! 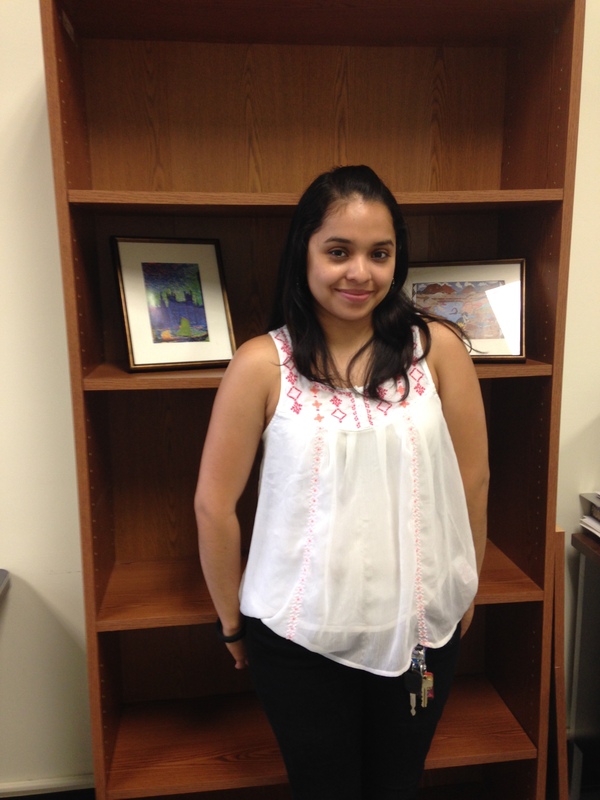 Patricia (Paty) Jaimes will be joining the Geocognition Research Lab as a new graduate student in July 2015. She was chosen to give the commencement speech at Northeastern Illinois University. Check her out and get inspired!